Microsoft made the following changes in their documentation (see screenshot above) to accurately reflect the memory limits on lower editions of SQL Server. The limits for In-Memory OLTP data is per database. A Standard Edition of SQL Server has buffer pool memory limited to 128GB, so the data and index pages cached in buffer pool is limited by 128GB. 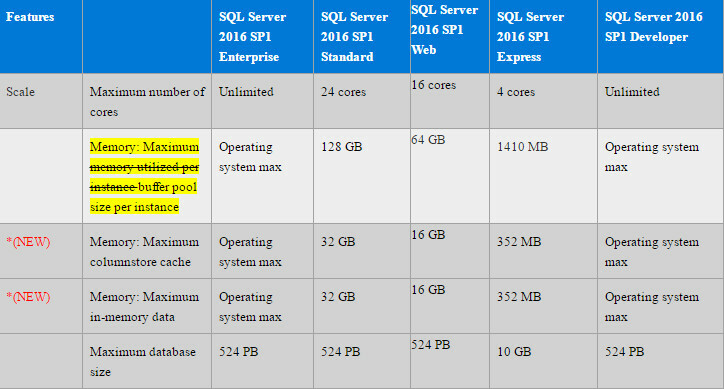 Starting with SQL Server 2016 SP1, you can have an additional 32GB of memory for Columnstore segment cache per instance and an additional 32GB of memory quota for In-Memory OLTP per database. In addition, there can be memory consumed by other memory consumers in SQL Server which will be limited by “max server memory” or total memory on the server if max server memory is uncapped. This is a T-SQL that will show all the last access date and time for Select, tables in a database. A sample T-SQL for determining uptime of a Microsoft SQL Server. I don’t remember the link I found this little tidbit at, but it’s useful. This will display the scheduled jobs on your Microsoft SQL Server instance that will be running in the future. I came across something that I found useful today when troubleshooting some query performance reports. I won’t re-post the entire article, but here’s what I found useful and I tweaked it to my needs by ordering by avg_fragmentation_in_percent as well as only displaying results with IPS.page_counts greater than 1000 and avg_fragmentation_in_percent greater than 75%. Find all the data and log file paths for all databases on Microsoft SQL Server instance. A quick method to find all the data and log file paths for all databases on a database server instance. Get MS_Description from all tables AND columns in a database. Suh-weet.